Murphy PowerCore® controllers and panels were specifically developed to put flexibility, power and control at your fingertips. Engineered to handle your toughest jobs, PowerCore solutions make controlling your mechanical or Tier 4 electronic engine as easy as pushing a button, but what does it take to set one up? To answer this and other questions, we turned to resident PowerCore expert Richard Lund. Thanks for sitting down with us today Richard. First things first, what kinds of engines are PowerCore controllers and panels compatible with? That’s a good question, and the reason we have to ask this question is because of Tier 4. PowerCore controllers and panels are compatible with almost any mechanical engine out there. Electronic engines are completely different because, especially with Final Tier 4, every engine manufacturer has their own addresses within the ECU that have to be dealt with through proprietary messaging. We have an engine manufacturer menu in the PowerCore software, and there’s about 15 engines in there right now that we’re specifically compatible with. For example, if you choose Kubota in that menu, we’re able to provide that special messaging in the background so we can talk to that Kubota engine in a way that it understands what you want it to do. Great. So I've got a compatible engine, what do I need to do to get a PowerCore controller or panel connected out of the box? The first priority is harnessing. If you buy a complete panel solution, like the ML series, harnessing is pretty simple as we sell pre-fitted MIH series harnesses for a large number of compatible electronic engines that plug into the easily accessible connector ports on the bottom of the panel. If you buy just the controller to put it in your own panel, we have open-ended harnessing that you can wire yourself or you can source the wire and connectors on your own to build one yourself. Harnessing sounds like it can be a hassle. If I buy a Murphy MIH series pre-fitted engine harness, is setting up a PowerCore panel as easy as plug and play? Yes, because the MIH harness uses the same 21-pin DEUTSCH mating connector that we have on the panels. You just plug the panel end into the panel and then plug the rest of the harness into your engine. It’s pretty much plug and play if you get an MIH harness from us, the only caveat is when you need extra I/O. To add additional I/O, you'll need to wire into the 31-pin connector on the bottom of the panel. We sell a I/O harness kit that plugs right in to the 31-pin DEUTSCH mating connector on the panel, but you'll have to wire it to the rest of your system yourself. Time for a curveball. What if I wanted to set up a mechanical engine with my PowerCore panel? What do I do to set that up? We don’t have pre-fitted harnesses for mechanical engines. For a PowerCore panel, you’ll need two open-ended harnesses—one for the 21-pin and one for the 31-pin—and you’ll wire them as you see fit. For MPC-10 and MPC-20 controllers to put in your own panel, we sell connector kits and open-ended whip harnesses with a few feet of wire to connect the controller to a panel. Alright. So I'm all wired up, what do I need to do to make the PowerCore controller or panel read my engine? With electronic engines, it’s pretty easy. You’ll go in, select the engine you have, select the Tier you have and information like oil pressure, water temperature and speed will start flowing to the controller. This setup is much easier on an electronic engine because you’ll get all that information from the ECU over the twisted pair of CAN bus wires. You don’t have to install separate senders and all that, but you will have to go in there and fine tune your set points. For mechanical engines, it's a little harder. You will have to select "mechanical" in the engine settings and you will have to connect to senders on your engine for oil pressure, water temperature, and stuff like that. You will need to wire those senders in to the inputs you want to use. We have some default settings for analog and digital inputs but you will have to enter your own set points. What about configuring additional I/O on a PowerCore panel, is that done the same way as setting up the engine itself? Yes. There is an Input/Output menu in there. Let’s say for a mechanical engine, you go in there and select an analog channel for oil pressure, an analog channel for water temperature, you might have a digital input you want to use for low oil level. So, you set all your analogs and digitals up right there in the I/O menu. And you have pretty good menu to choose from. Great. The display on the PowerCore controller is now showing the data from my engine and is monitoring the set points appropriately, but how do I set it up for a specific application like a general-purpose water pump for example? Perfect question. I wish more customers would ask this! We have an Application Configuration menu in the PowerCore settings where you can go to set this. The default is what we call “Pump All Purpose.” This means you see all the options available in the menu. But, let’s say you’re using a wind machine with propellers to stir the air up so it keeps the crops from freezing. You would go into the Application Configuration menu and instead select "Frost Protection" and that will only show the settings relevant for your application. The point of the Application Configuration Menu is to give you just what you need. What about auto start? How do I set that up? You just need to determine the conditions you want to start at and program it into the controller. If you say, “I want this engine to automatically start if this switch over here closes,” whatever that switch is, you can set that in the controller's settings and it will fire up your engine. The controller will continually monitor a piece of the I/O and if that I/O either changes levels past the threshold from a set point, or if a switch opens or closes, it will auto start the engine. Here's an example of how we've set this up on a center pivot irrigation system. Those systems are often set to auto start, but they also use the green or red buttons on the front of the panel because an operator is present when they start it. And auto stop is something that’s available too, right? How does this all change depending on the controller? Is configuring a TEC-10 much different than configuring an MPC-10, MPC-20, or other PowerCore panels? Good question. We went to great lengths to make sure if you can operate one, you can operate all. The MPC-20 controller and the ML2000 panel are kind of the big brothers— they have more I/O, more resources, more relays, and more hardware to it than the TEC-10, MPC-10 and ML1000-4X. But if you want to change a parameter on any of them, it’s pretty much identical. You go into the same menu. Now, there are some pins that are in the MPC-20 but not the MPC-10 and vice versa, but if you can configure one you can configure the other. We made it that way so if someone has several different PowerCore panels, they can send the same person out. If they're trained on one, they're trained on the other. Configuring one PowerCore controller sounds pretty easy, but is there any way to re-use the settings on another controller? Absolutely. The free PowerVision for Controllers PC configuration software lets you do everything you could do if you’re standing in front of a controller ahead of time. The free configuration tool is a simplified version of our PowerVision Configuration Studio® used to program the PowerView® displays. Our software team took the core version of PowerVision and focused it around configuring PowerCore devices so you don't need to be an engineer to set up your panel. If I wanted to configure a line of PowerCore controllers to go on an identical set of Kubota engines, I can open PowerVision for Controllers on my PC and configure all my I/O, all my speeds, choose Kubota for my engine manufacturer, choose the Tier, and then load it onto a USB. I would then just take the USB with my configuration file on it, connect it to the controller or panel using a USB programming harness (or the CAN port on the TEC-10) and load all my settings at once. Advanced users can also use the full version of the PowerVision Configuration Studio software, which is not free. Using the full PowerVision allows you to change the complete personality of the PowerCore controller for an application that is not predefined in the software. Most customers don't need to do this, but there’s always someone out there who needs to change what inputs do and how they function. But we designed the PowerCore to handle most industrial stationary applications as-is, and that’s from years of features we’ve grown up with and developed and know that we need. The full PowerVision Configuration Studio software is an advanced step for very specific needs, but when needed the power is there. Last question, can I monitor my PowerCore controller or panel remotely? Yes. All PowerCore products have a communication port called an RS485. It’s a basic two-wire communication port that you can wire in, and inside the software is a MODBUS map. You can get in there with a telematics module and read a bunch of registers and see if the engine is running and all sorts of information like what the oil pressure is. You can tell it to start and stop; you can tell it to change speed; you can also change set points. That’s all done through telematics, and we now have our own system we call Murphy CONNECT. 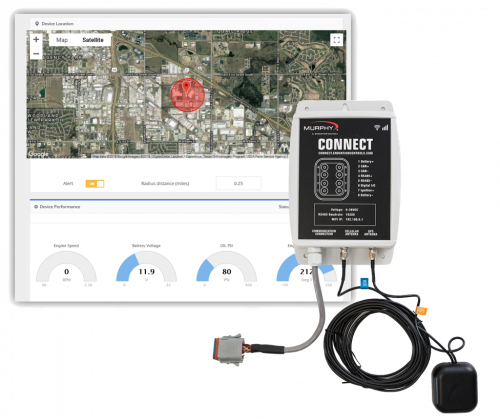 Our Murphy CONNECT telematics unit can write to the MODBUS map in all the PowerCore products over the Internet. So, I can be on my cell phone or my laptop here in California and connect to an MPC-20 on a center pivot in Iowa. I can start it, I can stop it, I can see what it’s doing and control it all while mobile. Murphy CONNECT is easy because we've done all the hard work for you. If you use a telematics unit from another company, you can't just hook up the module and wire it in because you'll also have to write code. A telematics programmer has to write special code to know what registers do what, and they also have to get a MODBUS driver to get in there and write code to have access to our MODBUS map. With third-party telematics it’s not plug and play, but with Murphy CONNECT it is. Murphy CONNECT is set up for our MODBUS map out of the box. We'd like to say a big thanks to Richard Lund for his time and expertise to answer all our questions. If you have technical or general questions about your PowerCore controller or panel that we didn't answer, contact our Sales or Support team. Don't have a PowerCore controller or panel yet? Find your local Murphy by Enovation Controls distributor using our Find a Distributor tool.